Heisman Trophy finalist and former Air Force star quarterback Dee Downis died on Monday in a two-car traffic accident. Gwinnett County (Georgia) Police confirmed that Dowis, 48, was killed in a traffic accident on Interstate 85 around 5 a.m. 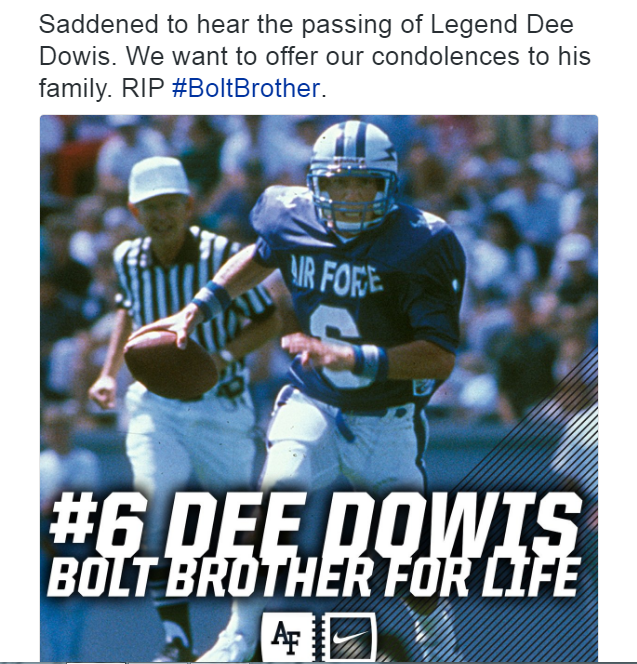 The Air Force Football Twitter page said they were “saddened to hear” that Downis had passed away. Many colleges passed up on Dowis and he was only lightly recruited to play college football because he was only 5-foot-10 and 153 pounds playing the quarterback position. He became a starter for Air Force Academy coach Fisher DeBerry when he reached his sophomore year, breaking several records. He rushed for 1,315 yards, an NCAA single-season record for quarterbacks that stood for 12 seasons until Indiana’s Antwaan Randle El broke it. As a senior in 1989, Dowis became the fifth player in NCAA history to run and pass for more than 1,000 yards in a season. He ran for 1,286 yards in his senior year with 18 scores and also threw for another 1,285 yards with seven touchdowns. He placed sixth in the Heisman voting that year. He was only one of three other service members to ever do that well in the Heisman voting since Roger Staubach won it in 1963. Dowis was traveling in the opposite lane of I-85 at about 4:48 a.m. Monday morning when he pulled into the median and tried to back his 2014 BMW out of it. While doing so, it was struck by a northbound vehicle on the driver’s side door. He was pronounced dead at the scene and the Gwinnett County police said he was not wearing a seat belt. Dowis, who lived in South Carolina and worked as a pharmaceutical sales representative for Pfizer, is survived by his wife, Tracie and their two children, Maddie and Grant.